“I don’t know if you know much about feral hogs, but they reproduce three or four times a year, they eat anything and everything, and I kind of think there is some comparison between bureaucrats and feral hogs.”-Oklahoma Labor Commissioner Mark Costello as quoted in the Tulsa World. Oklahoma Labor Commissioner Mark Costello might be trying to backtrack on his comments comparing at least some state employees to “feral hogs,” but, if anything, he’s only making it worse. On Sept. 13, Costello, pictured right, spoke before the Republican Women’s Club of Tulsa County and introduced his new organization, “Parity in Oklahoma, whose primary purpose appears to be undermining state employee benefits and protections,” according to a story in the Tulsa World. Along the way, the story states, Costello compared bureaucrats to feral hogs. His comments, even in today’s divided political world, should be more than a just a blip in the political discourse. Perhaps, some people have just become numb to the political vitriol, but the remarks were especially ugly, demeaning and humiliating to the thousands of public workers and teachers in the state. They show Costello, as Labor Commissioner, has an obvious, in-your-face, anti-state employee agenda. Although the World story doesn’t note it, I wonder if those at the meeting laughed or applauded as Costello made his remarks. It makes for an ugly image. 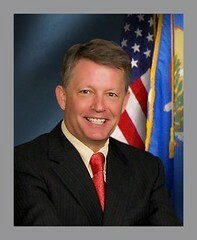 The Oklahoma Democratic Party ODP, under the leadership of Wallace Collins, was quick to respond, demanding Costello’s resignation. Costello then backtracked, claimed he was taken out of context and told FOX 25 News he was referring to special interest groups like the Oklahoma Education Association. That’s supposed to make it better? The OEA and other state employee “special interest groups” are made up of teachers and public workers. What’s the difference here? This is just the latest example of the ongoing attack on teacher and support professionals by an extremist politician in a misguided attempt to make a point at the expense of the hardworking public servants who teach our children, feed them lunch and deliver them safely to school. Name calling and bullying of this nature is not tolerated in our schools and shouldn’t be allowed by politicians like Mr. Costello. State Labor Commissioner Mark Costello’s comments this week comparing state workers to feral hogs was atrocious and completely unprofessional. I think the Commissioner has forgotten that his job is to protect state workers not undermine them, which seems to be the purpose of his newly created nonprofit.
. . . a newly-hired, merit-protected state government worker cannot be fired for showing up on the first day of employment inebriated. Why not? Because under the Merit Rules (see below), only a habitually drunk employee can be fired. This is a ridiculous state policy. Any employee in the classified service may be discharged, suspended without pay for not to exceed sixty (60) calendar days, or demoted by the agency, department, institution, or officer by whom employed, for misconduct, insubordination, inefficiency, habitual drunkenness [emphasis added], inability to perform the duties of the position in which employed, willful violation of the Oklahoma Personnel Act or of the rules prescribed by the Office of Personnel Management or by the Oklahoma Merit Protection Commission, conduct unbecoming a public employee, conviction of a crime involving moral turpitude, or any other just cause [74:840-6.5(C)]. How can anyone draw the conclusion that you couldn’t fire someone for showing up drunk for work from this Merit Rule? Of course, showing up to work drunk would fall under other categories, such as misconduct or “inability to perform the duties of the position . . .” Why this weird, specific scrutiny about drinking, anyway? It just shows Costello has to really search and stretch to make his right-wing points. The site essentially gives Costello a forum to advance his political views. Is he considering a run for another office down the road? Is his site really just a campaign site? « More Newspaper Cuts in Post-Gaylord Era?